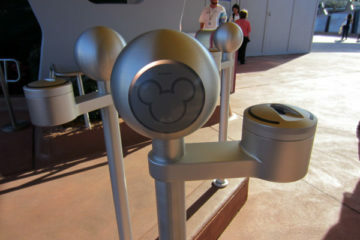 Disney is known for their use of technology and inventing really cool things. This goes all the way back to Walt himself, and his contract with Technicolor for exclusive use of their three-color process for three years. 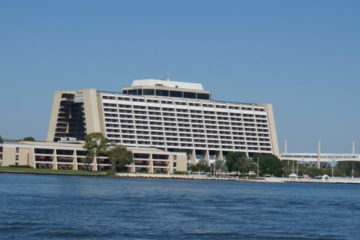 Walt also lead a team he called WED Enterprises; these people were responsible for making Walt’s visions come to life. One thing that they accomplished was the audio-animatronic. While Disney and his team didn’t actually invent the AA (as it is often abbreviated), they did expand upon an existing technology – making it more elaborate and entertaining than ever. The story starts when Walt visited New Orleans. He found a bird in store that sang and moved. He purchased the bird for Lillian, his wife, but showed it to his engineering team first. He tasked them with figuring out how the bird worked then building their own, better, version. The first audio-animatronic was created by machinist Roger Broggie and sculptor Wathel Rogers. They built a nine inch tall figure modeled after the dance routines of Buddy Ebsen, a vaudeville performer. They used cameras, cables, and tubes to make the Little Man tap dance. 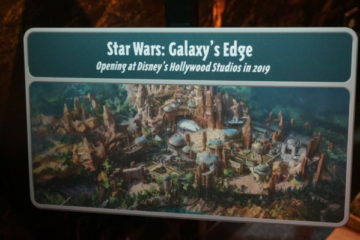 The project was put on hold so they could work on Disneyland, but it was completed in the early 1960s. Walt wasn’t happy that the character had exterior mechanics, and his team told him that creating a larger character would allow them to put all of the mechanics inside the character – and out of sight. 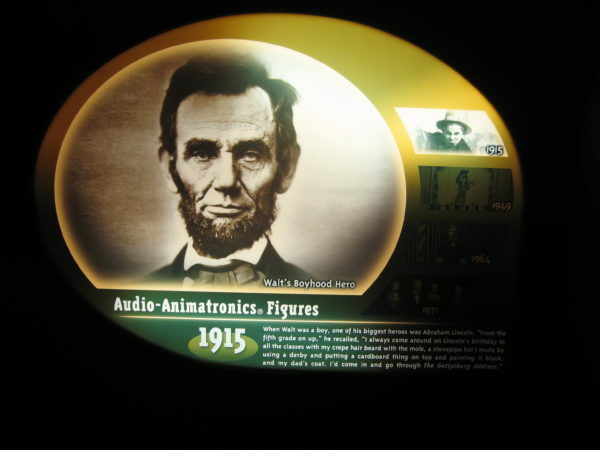 Abraham Lincoln was one of Walt’s childhood heroes, so it should come as no surprise that Lincoln was the first audio animatronic the Imagineers developed fully. At this suggestion, Walt asked his Imagineers, as they were known by now, to create a Confucius-like character that would sit in the lobby of a restaurant and provide wisdom after visitors asked a question. The Imagineers created the head and were able to make it blink and move its mouth, but this project as abandoned to create President Lincoln. Walt wanted to create an entire attraction based on all of the presidents of the United States, but that was pretty ambitious. He needed to create some attractions for the 1964 World’s Fair, so he decided to start with Lincoln and get his home state of Illinois to sponsor the pavilion. The Lincoln project would allow all of the mechanisms to be held inside the character, which would stand up, sit down, and speak a pre-recorded message. 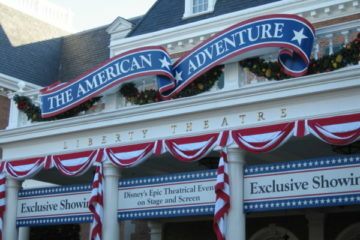 He was the world’s first audio-animatronic human figure and he was the star of the Great Moments with Mr. Lincoln show. An identical show opened in Disneyland in 1965 while performing at the World’s Fair, which means the Imagineers created two Lincolns in a very short time period. Great Moments with Mr. Lincoln operated at the World’s Fair until October 17th, 1965 and in Disneyland until 1972. Lincoln reappeared in 1975 and has remained part of the park ever since, with the exception of a four-year break from 2005 to 2009 for Disneyland: The First 50 Magical Years. Disney actually owns the rights to the term “audio-animatronic”. The term was first used commercially in 1961 during the creation of Project Little Man. Disney filed the trademark in 1964 with the creation of Mr. Lincoln, and it was registered in 1967. Since then, Disney has created AAs for shows and attractions reducing the amount of live actors necessary to keep the parks running. The Enchanted Tiki Room opened in 1963 in Disneyland as the first show to use audio-animatronic technology. This show brought to life Walt’s bird from New Orleans and created 150 talking, singing, dancing birds to fill the attraction. Their eyes and faces moved with the musical score. 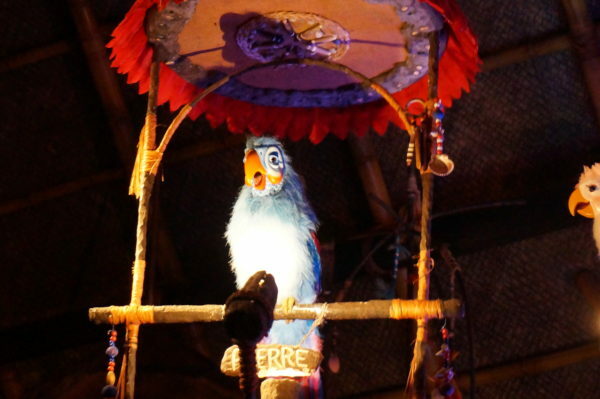 The Enchanted Tiki Room was inspired by the animated bird that Walt found during a trip to New Orleans. This show was also the first use of electromechanical technology for the animatronics. You see, there was a problem with Mr. Lincoln. He functioned with machinery that needed oils to move his parts. During one of the shows at the World’s Fair, Lincoln sprouted a leak, which was visible to the audience. Most unfortunate, the leak was red and brought to mind Lincoln’s assassination. Disney didn’t want this to happen again or have oil drip on guests below, so they created the electromechanical technology for the birds so they would use pneumatic movements triggered by sound. Disney continued to use animatronics in shows and attractions and perfect their technology over the years. Check out the rest of the articles in this series later this week for classic audio-animatronics, retired audio-animatronics, and advanced technology in audio animatronics. 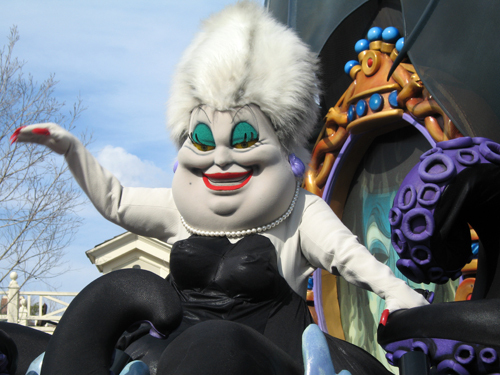 Are you a fan of Disney audio-animatronics? Disney World to Ban Group Chants?